America’s current "war on drugs" is not the nation’s first. In the mid-nineteenth century, opium-smoking was decried as a major social and public health problem, especially in the West. Although China faced its own epidemic of opium addiction, only a very small minority of Chinese immigrants in America were actually involved in the opium business. It was in Anglo communities that the use of opium soon spread and this growing use was deemed a threat to the nation’s entrepreneurial spirit and to its growing mportance as a world economic and military power. 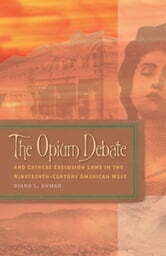 The Opium Debate examines how the spread of opium-smoking fueled racism and created demands for the removal of the Chinese from American life. This meticulously researched study of the nineteenth-century drug-abuse crisis reveals the ways moral crusaders linked their antiopium rhetoric to already active demands for Chinese exclusion. Until this time, anti-Chinese propaganda had been dominated by protests against the economic and political impact of Chinese workers and the alleged role of Chinese women as prostitutes. The use of the drug by Anglos added another reason for demonizing Chinese immigrants. Ahmad describes the disparities between Anglo-American perceptions of Chinese immigrants and the somber realities of these people’s lives, especially the role that opium-smoking came to play in the Anglo-American community, mostly among middle- and upper-class women. The book offers a brilliant analysis of the evolution of the Chinese Exclusion Act of 1882, plus important insights into the social history of the nineteenth-century West, the culture of American Victorianism, and the rhetoric of racism in American politics.